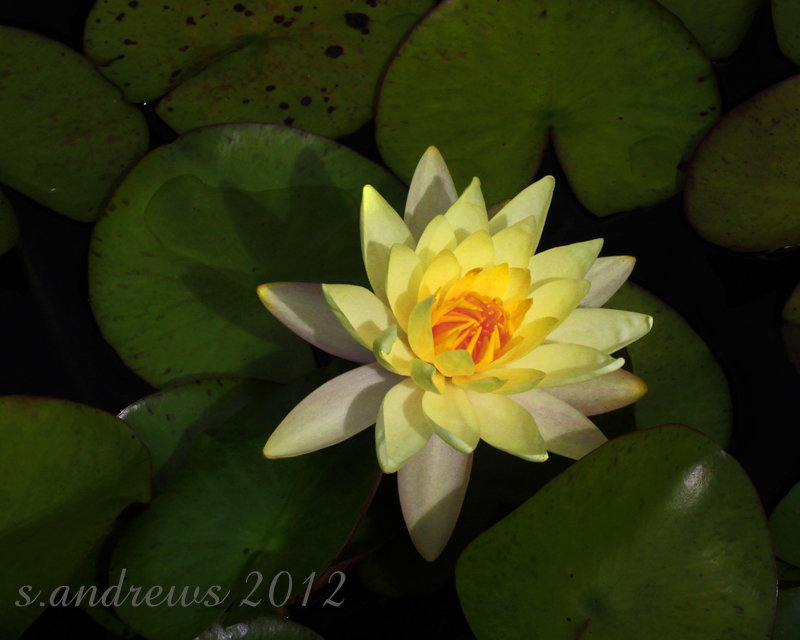 The princess of a water feature or pond; a waterlily. The classic profile of a perfect bloom plays off the colors of the large leaves floating easily on the still water. 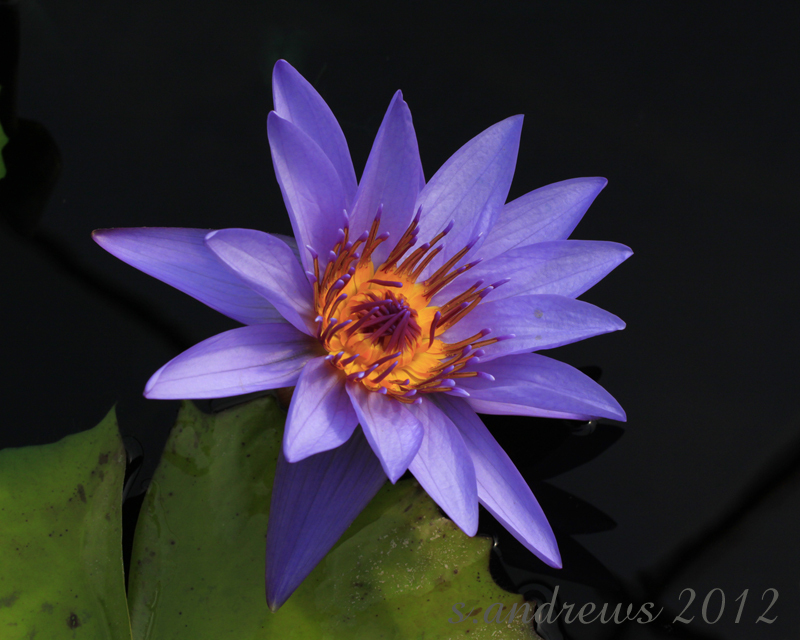 They come in some stunning colors, from purples and pinks to pristine whites and soothing yellows. The centers are striking combinations of yellows and purples and whites giving the lucky admirer a real treat! 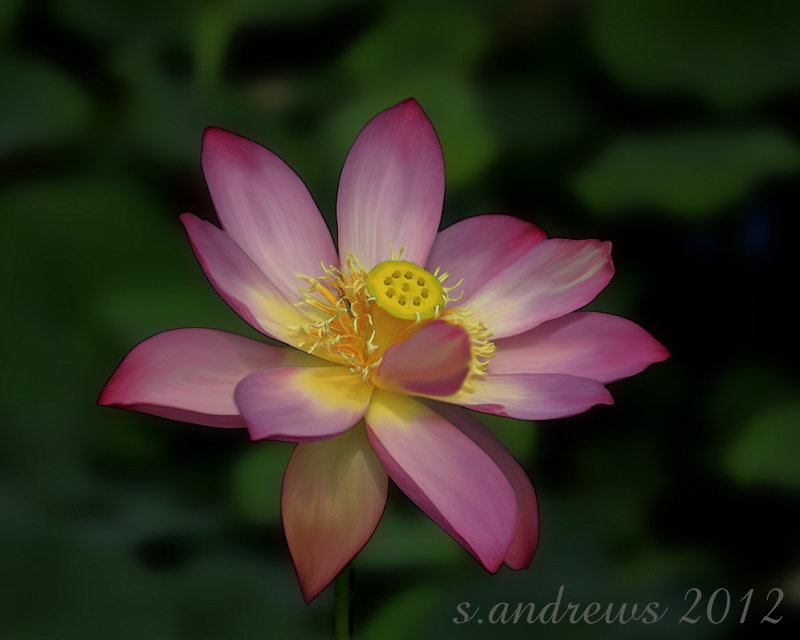 The lotus is also a water lily; one in a class of its own. 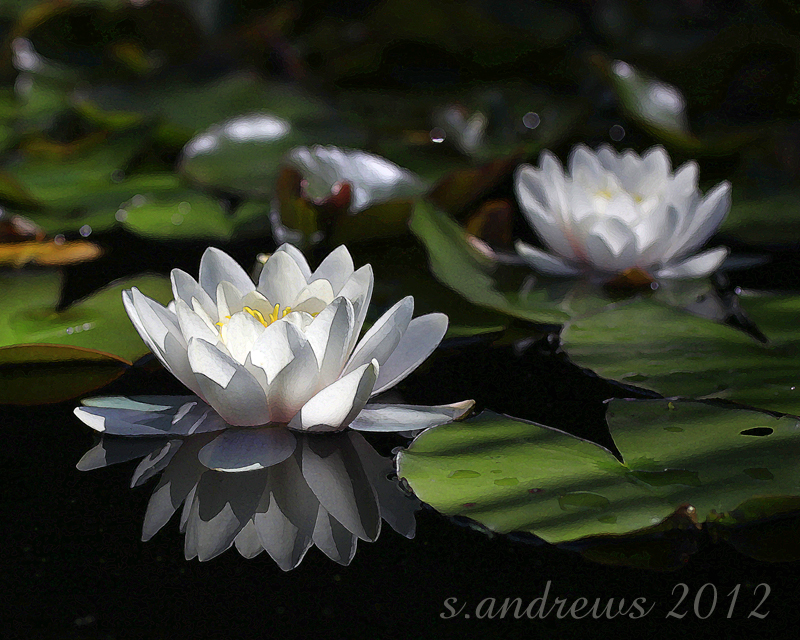 For thousands of years it has long been a symbol of spiritual enlightenment. 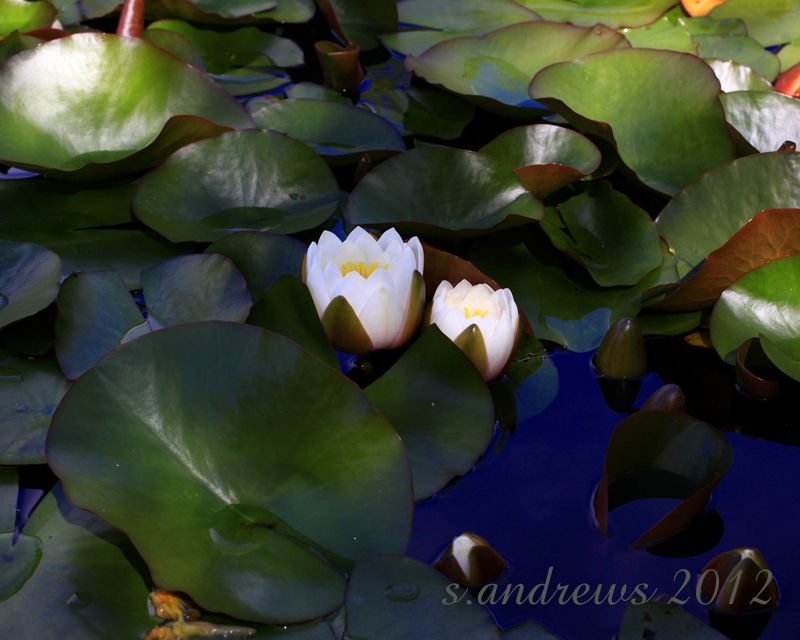 Like all water lilies it blooms from a plant anchored on the bottom of the pond; all mud and muck. This plant give us one of the most beautiful and unique blooms in the world. 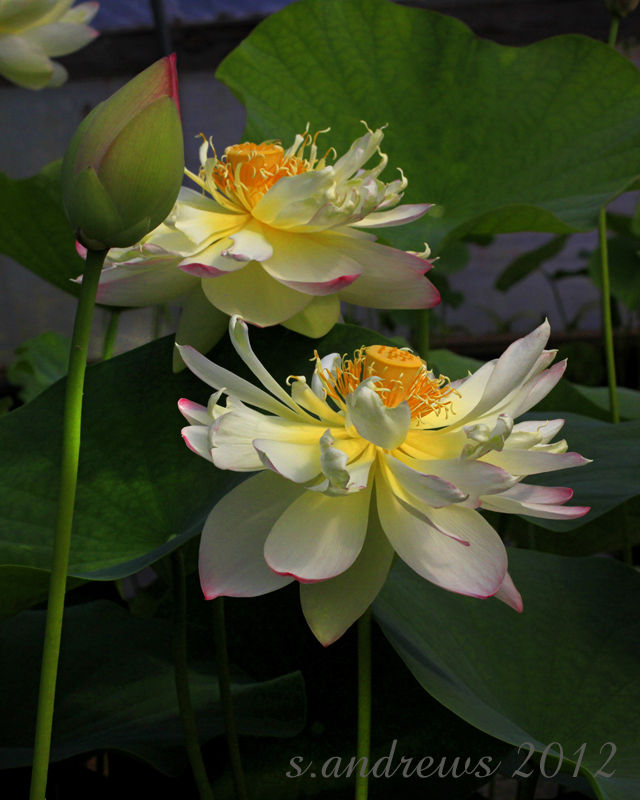 The bud is a classic pointed oval, which blooms with a cup shaped flower resembling a peony or multi-petaled rose. The bloom opens to reveal an arrangement of pistils and stamens is that is beautifully unique; the yellow flat topped center holds the female pistils, with the stamens around the base of the center and the petals like a decorative fringe. After pollination the flower falls apart, leaving just the flat topped center to ripen the seeds. The ripened center, or lotus seed head, is a very common image. You will see the progression of my art in this post; how an image changes under my mouse. To view larger in a photo carousel click on any image. 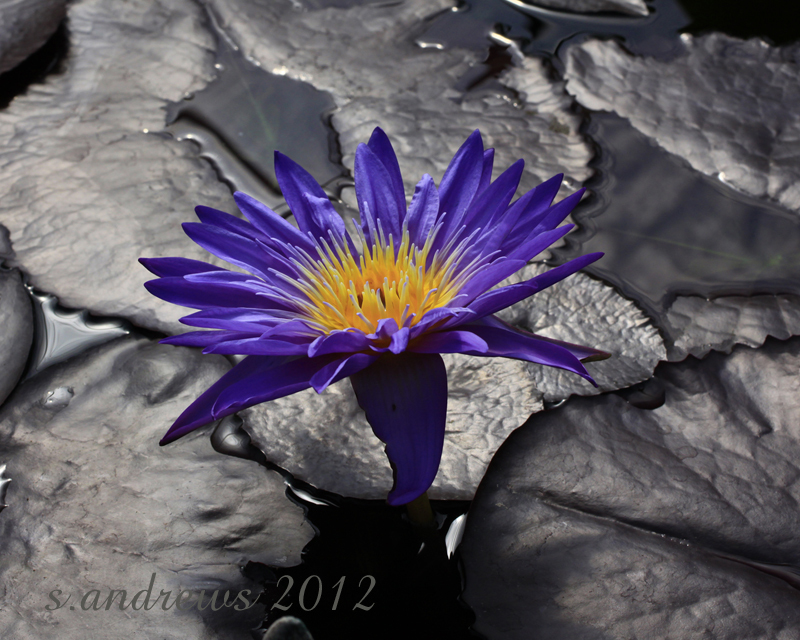 Purple Water Lily; the black background is the result of metering the camera into the sun. 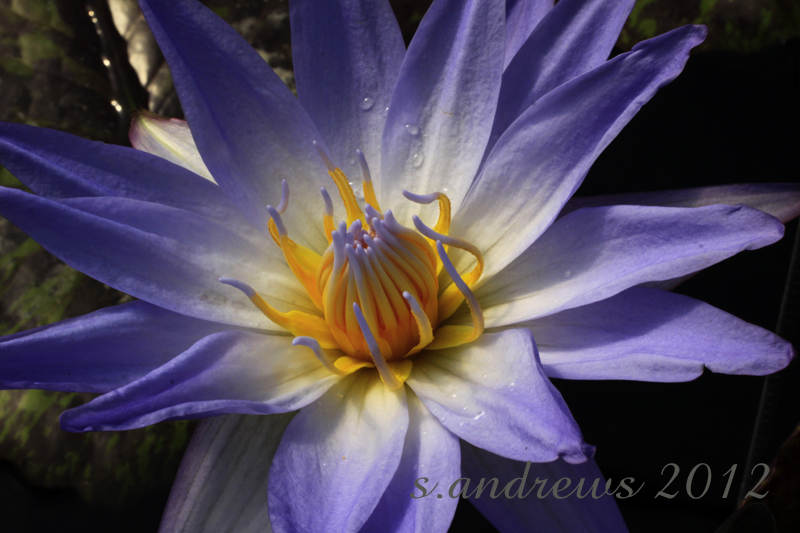 Purple tipped center Water Lily; the stamens look hand painted. Purple Shadow is the result of some creative edits. 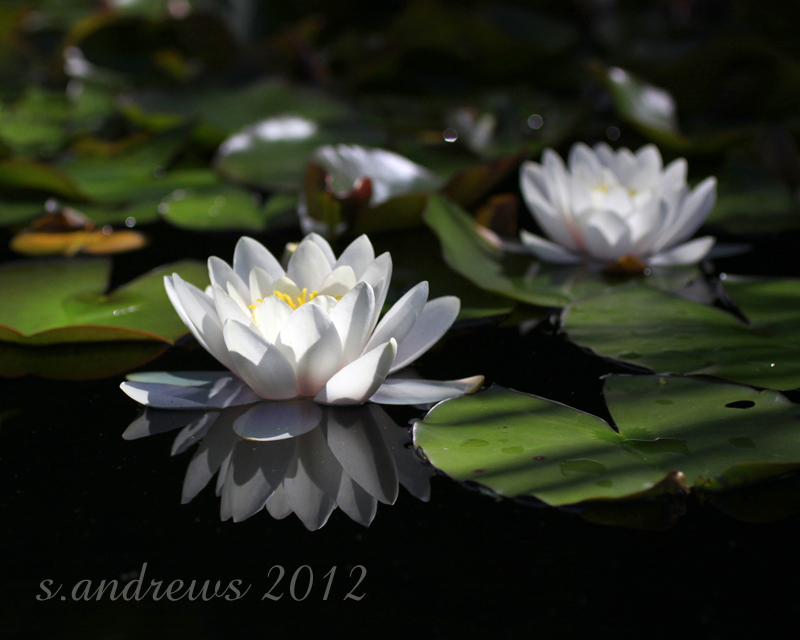 Two White Water Lilies showing off in the sunshine …. become this image with some well placed edits. 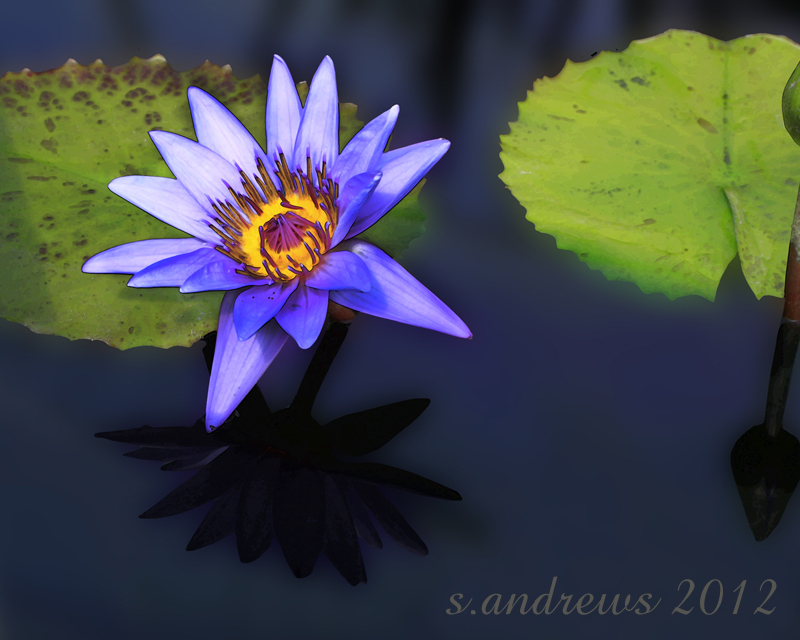 becomes this rendering of Water Lilies. 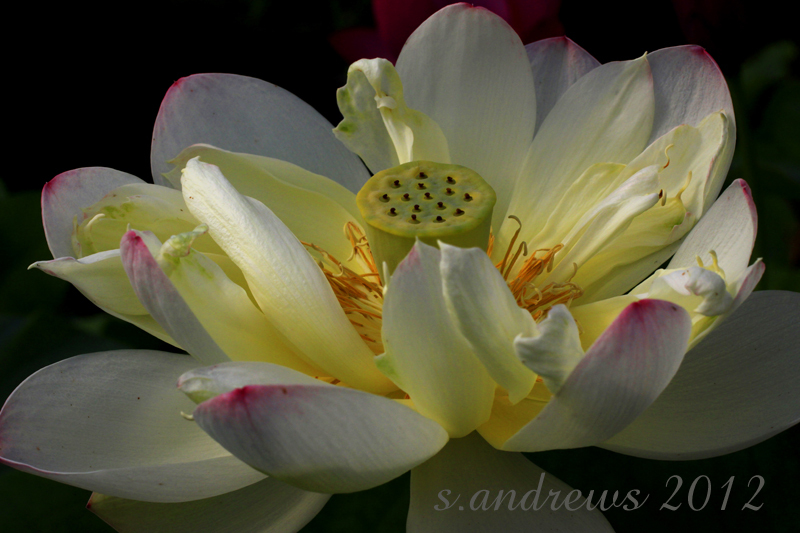 Yellow Lotus blossoms; what a stunning flower. 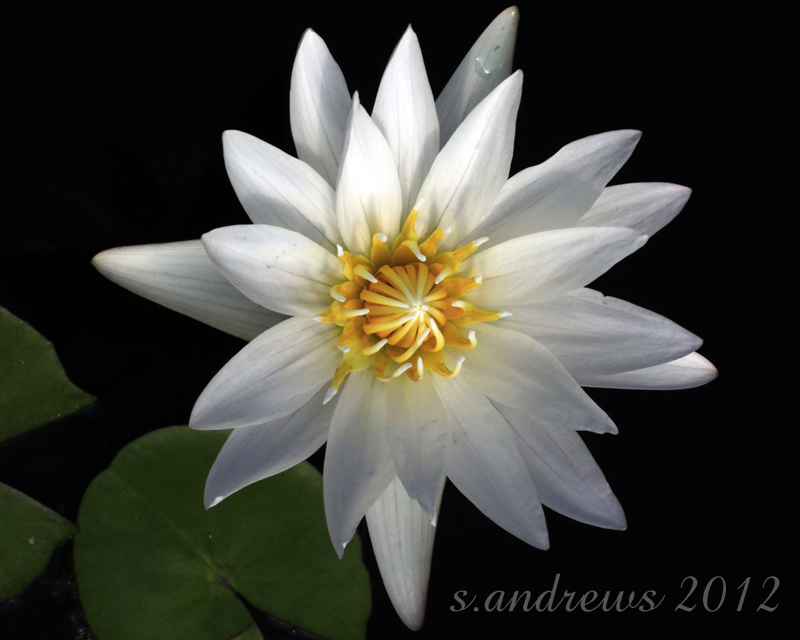 White Lotus up close and personal, so you can see the unique pistils and stamens. 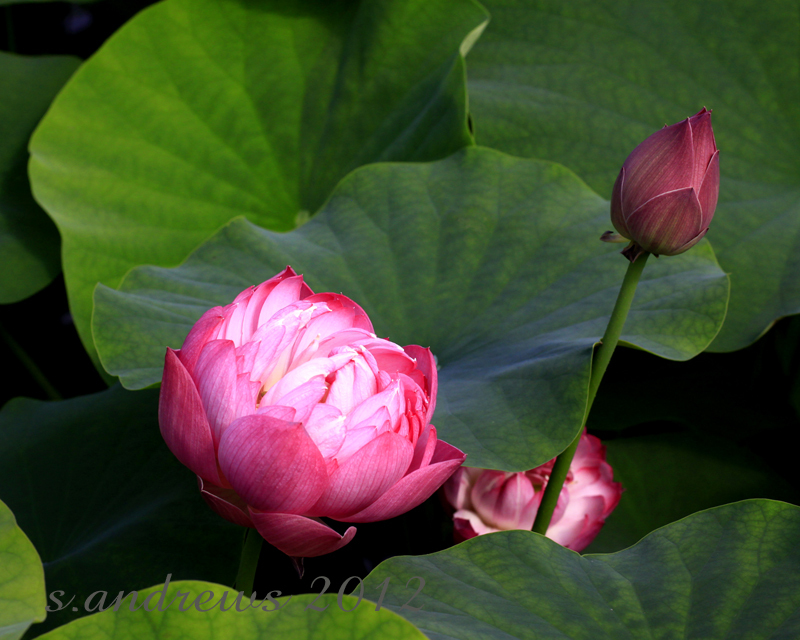 Pink Lotus buds; note the cup shaped bud as it opens over the water. 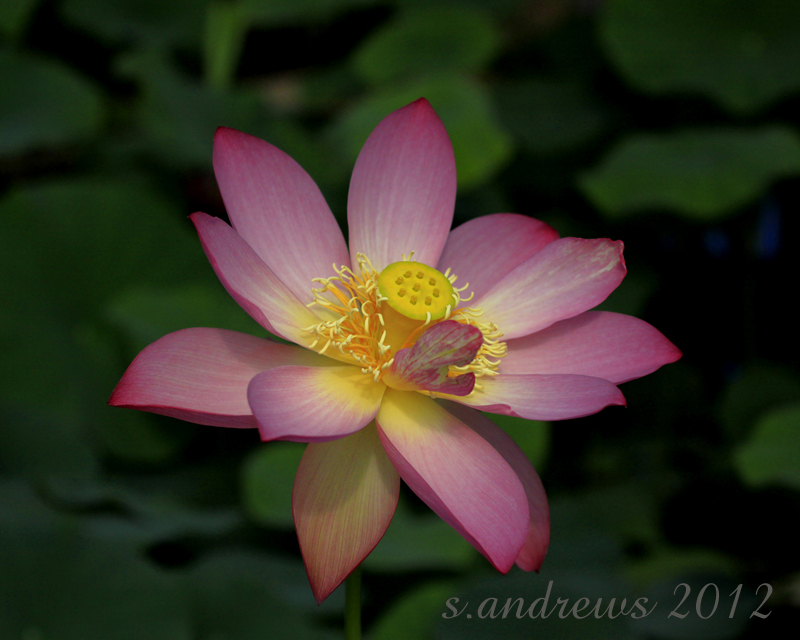 Pink Lotus; flawed beauty was an exquisite bloom with a prominent flaw ..
See my post *Red Dragonfly for more photos from the lily pond. 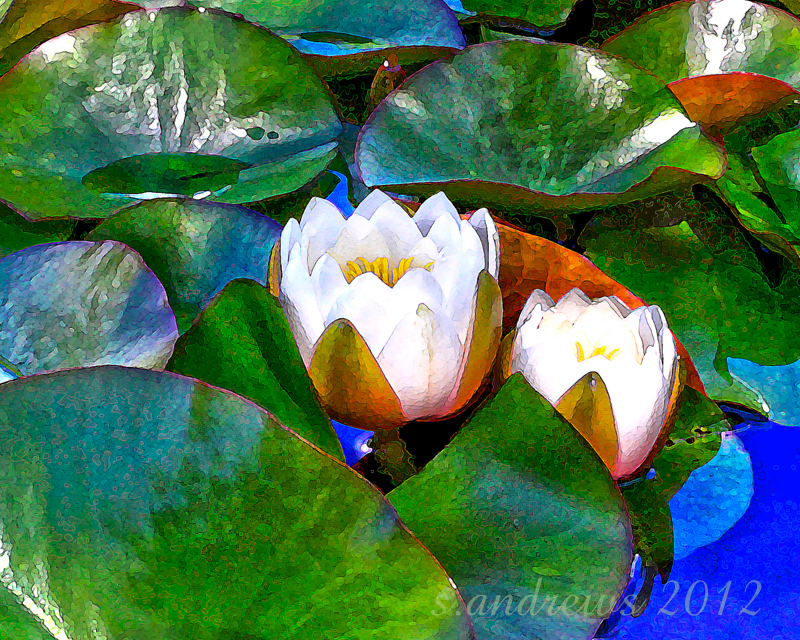 This entry was posted in uncommon everyday art and tagged June, lily pad, lotus, pink, purple, water lily, white, yellow.